The Lighthouse Tower will be the very first introduction of the residential spaces at Daniels Waterfront. One of a kind opportunity to buy into Toronto’s very first office condominium on the waterfront. This spectacular waterfront community that will change the way Lower Jarvis & Queens Quay East looks forever. 132 Queens Quay East has once stood the 2.8 acre Guvernment and Koolhaus Entertainment Complex, Canada’s largest nightclub which The Daniels Corporation purchased to build condos and commercial properties. Charles Khaboth, owner of INK Entertianment tried to buy the building with his partners but were unsuccessful as Daniels Corp. has bought it to turn the site at Queens Quay and Lower Jarvis into residential and commercial properties known as the Daniels Waterfront Condos. 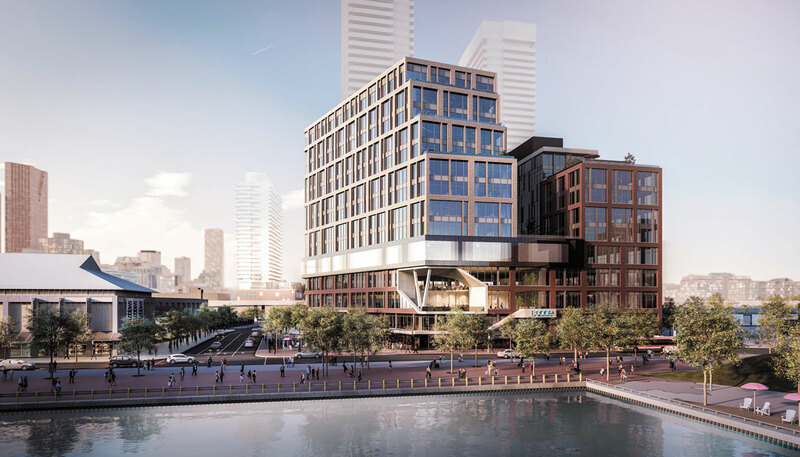 Daniels Waterfront City of The ArtsCondos will consist of 650,000 square feet of residential space, 280,000 square feet of office space, 240,000 square feet of major post-secondary space and 150,000 square feet for the creative industries hub. This development is bounded by Quees Quay, Jarvis Street, Lakeshore Boulevard and Richardson Street in Toronto. There are 516 proposed suites ranging in size from 347 square feet to 790 square feet and priced from $279,900. The suites will consists of bachelor units, 1 bedroom units, 1 bedroom + den units and 2 bedroom units. The top two floor will be reserved for the penthouse suites. Giannone Petricone Associates Inc. is the architect and the interior design will be by Cecconi Simone Inc. There will be two outdoor zones. One is for the recreation zone and the other is for the entertainment zone. The recreation zone consists of a full size tennis court and community gardening plots which are located on the 9th floor. The entertainment zone is located on the 14th floor and consists of the cocktail pool, landscaped terrace with lounge areas and the barbecue area. Indoor amenity space that is located on the 9th floor will consist of the fitness centre with change rooms, music studio, art studio, gardening prep studio and a home theatre. The 14th floor indoor amenity space will consist of a catering kitchen, lounge, party room, private dining room and a gathering zone. The Lighthouse Tower will consist of a 48 storey condominium tower on top of a 5 storey podium which will house a “prominent academic institution”. This tower will offer panoramic views of the city’s skyline and has a 24 hour concierge and a “Resident Service Director will provide on-site customer service for residents”. The Daniels Corporation is building other communities in other areas of the GTA as well, they also have Daniels City Centre Condominiums in the heart of Mississauga. Another high rise building that will be 40 storey high and just steps from Square One Mall. This condominium tower is part of a 23 acre master-planned community that will be offering 1 bedroom, 1 bedroom + den, 2 bedroom and 2 bedroom + den suites. This project is now selling and is not to be missed so register with us today for your access to the “Daniels Waterfront – City of the Arts ” by The Daniels Corporation!